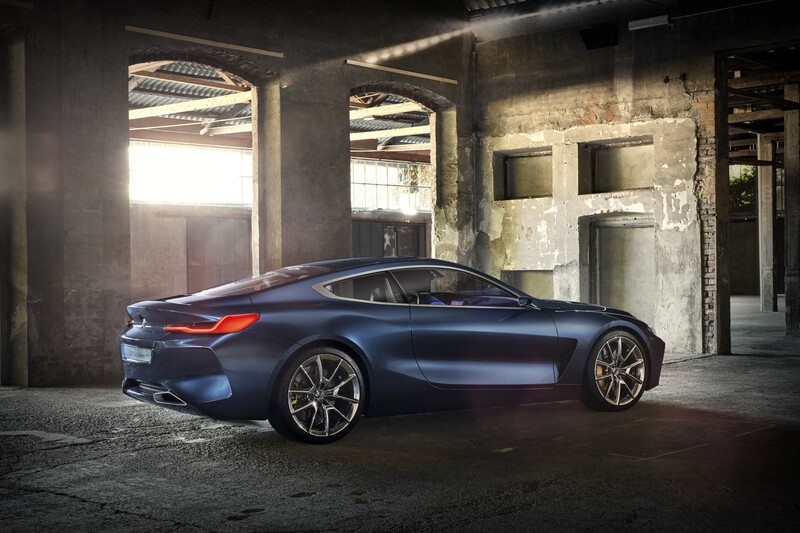 MILAN, Italy — When the original BMW 8 Series launched in 1989, it was anything but conventional. 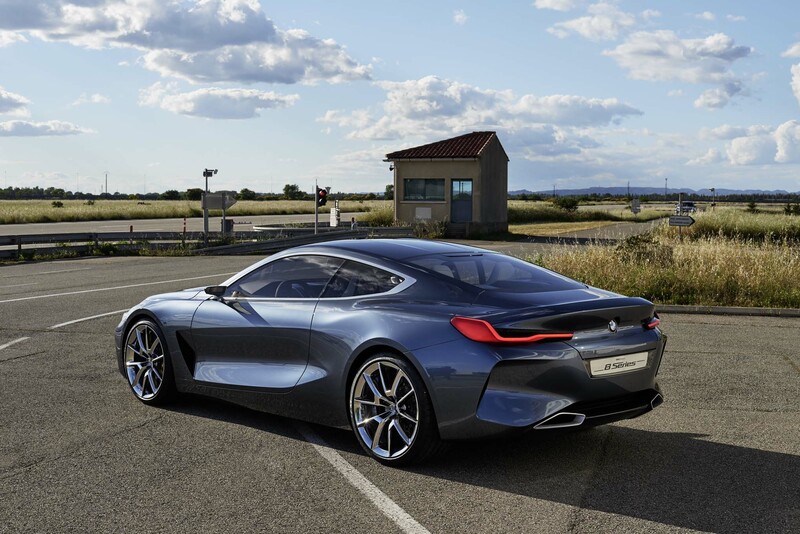 Wider and lower than the outgoing first generation 6 Series, the 8 Series made a statement with its wedge-like profile, narrow front grille and available 12-cylinder engine that could be paired with a manual transmission. 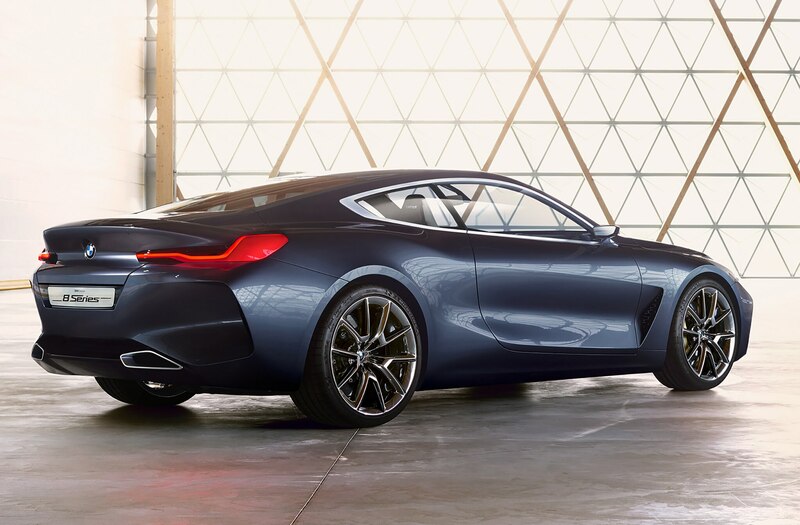 A true dream machine from the Bavarian automaker, the first-generation 8 Series became an instant classic. Even today, seeing one on the road still causes double takes and Instagram snaps. 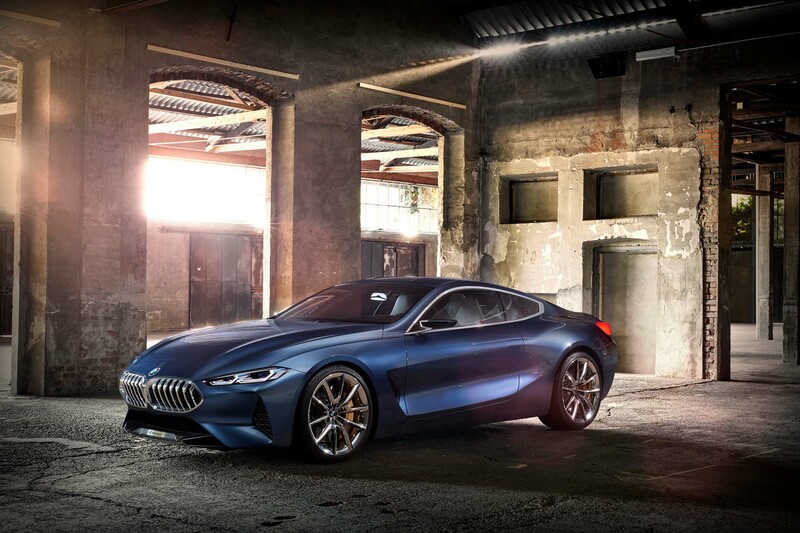 BMW is hoping to recapture some of the original’s magic with its new Concept 8 Series that was unveiled on the shores of Lake Como, Italy, during the Concorzo d’Eleganza Villa d’Este. 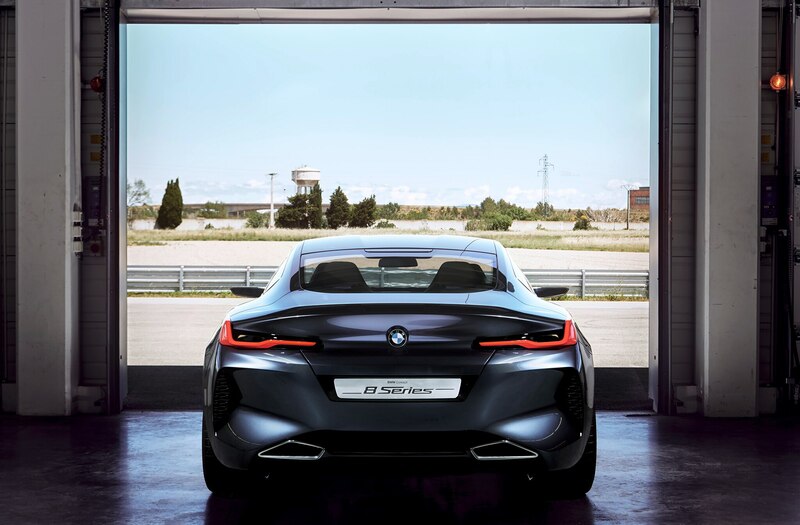 We got an advanced look in an empty industrial textile building in Milan just days before its grand reveal. 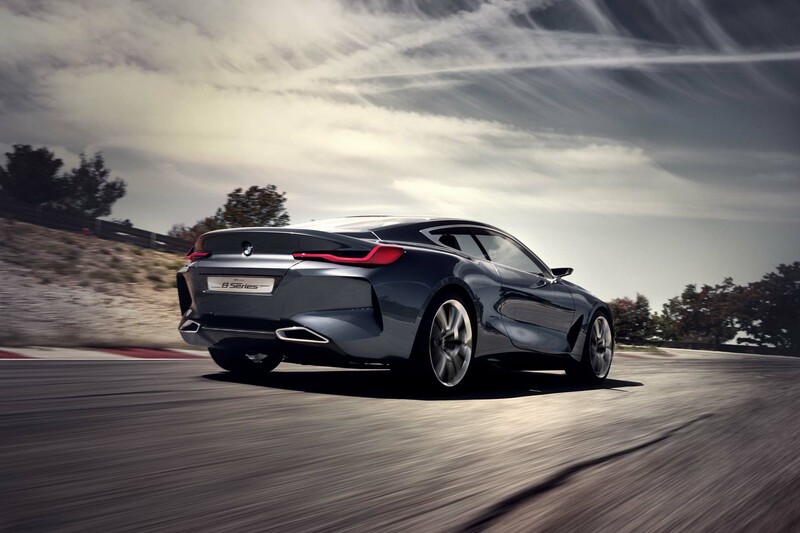 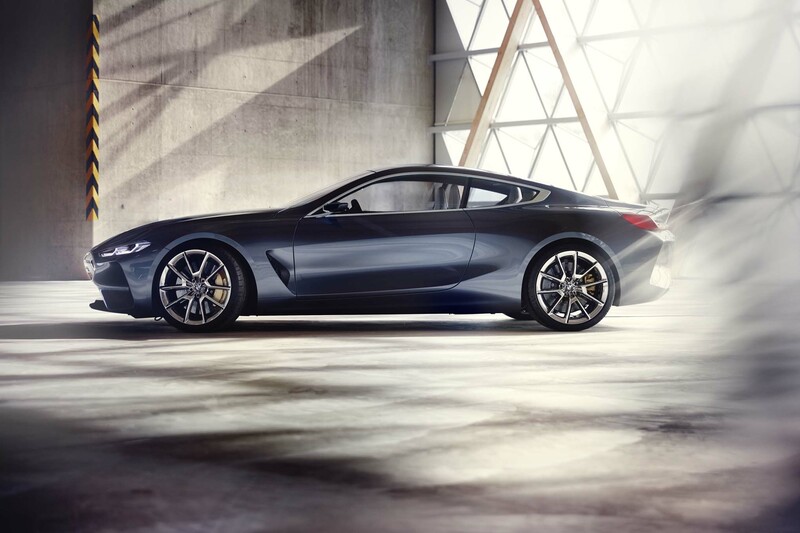 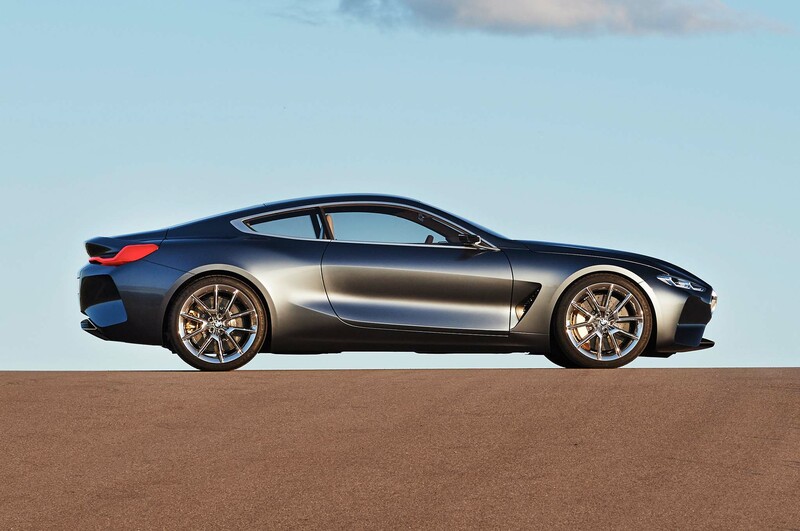 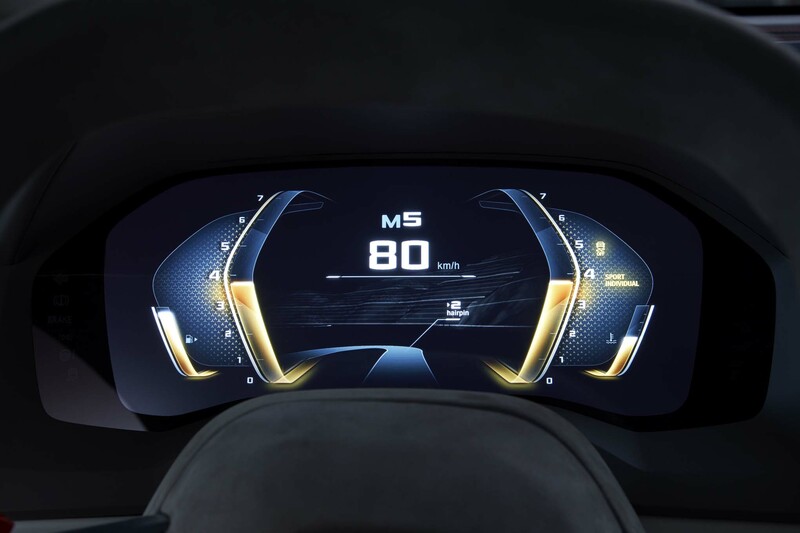 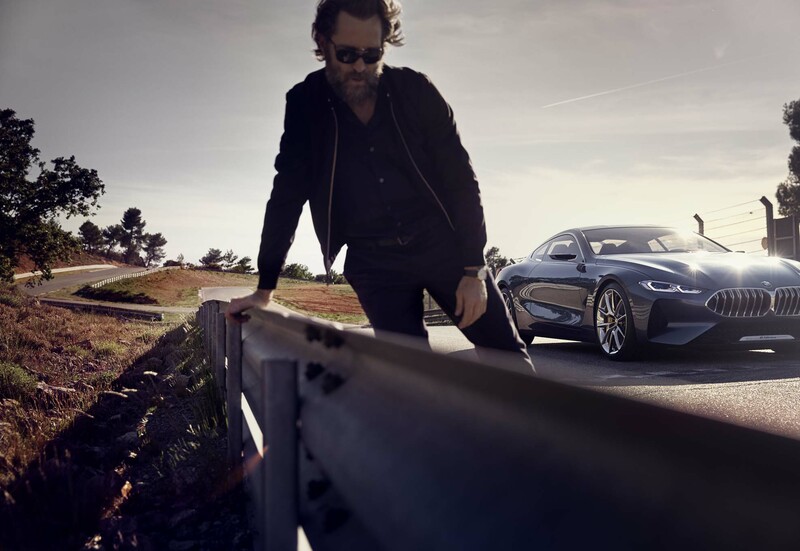 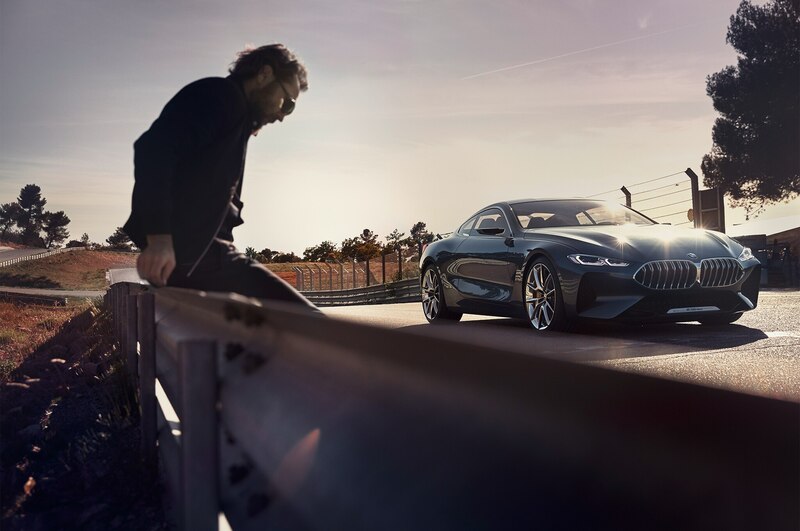 “The BMW Concept 8 Series is our take on a full-blooded driving machine,” according to Adrian van Hooydonk, the senior vice president of BMW Group Design. 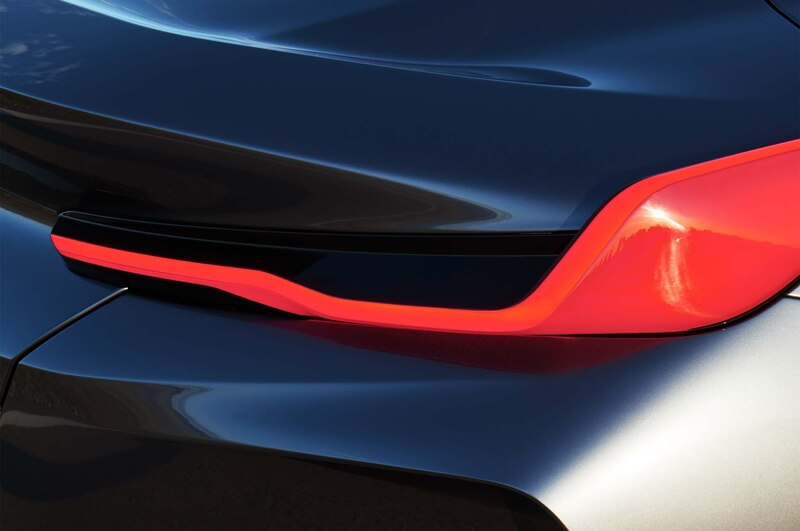 The photos you’re looking at are slightly deceptive. 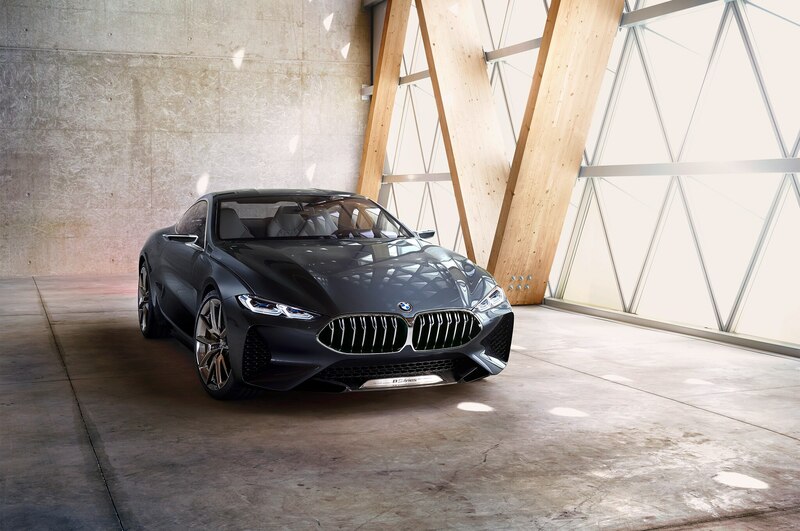 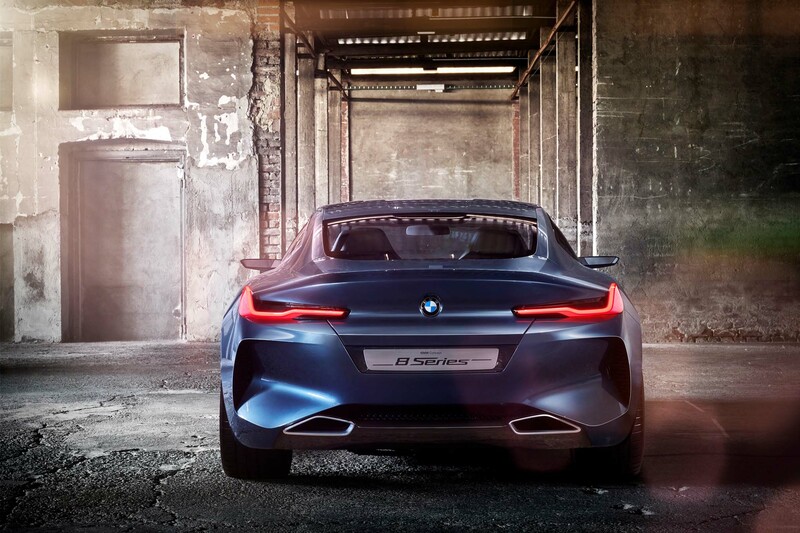 In the sheetmetal, the Concept 8 Series looks larger and more menacing than it does in photographs. 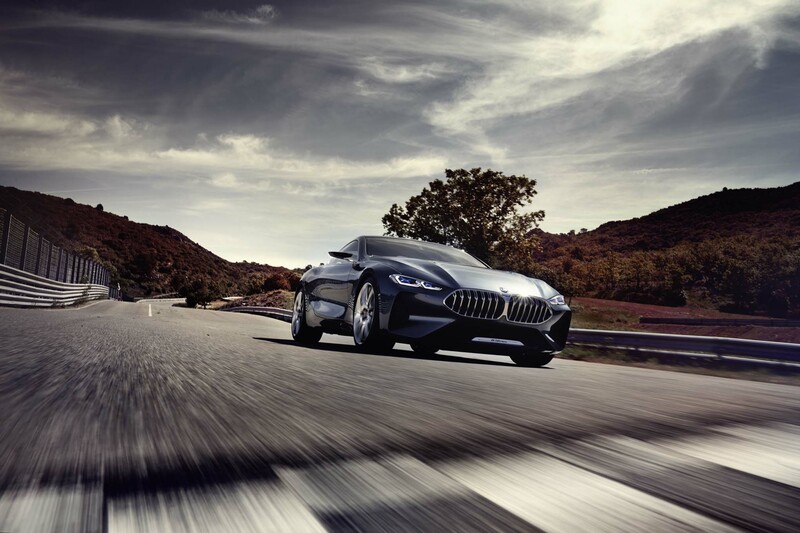 Its low roofline, broad rear fenders, low front end, and rear-wheel-drive chassis all promise power coupled with elegance, which is exactly the right recipe for a car aimed at giving a sportier alternative to the decidedly non-sporty Mercedes-Benz S-Class Coupe. 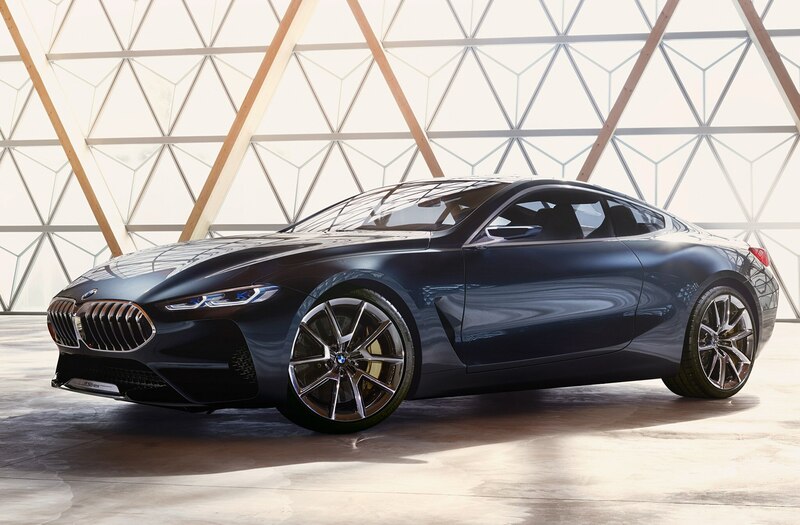 It’s a slightly busier, but more interesting design than the Lexus LC, boasting nearly as much presence as Aston Martin’s striking DB11. 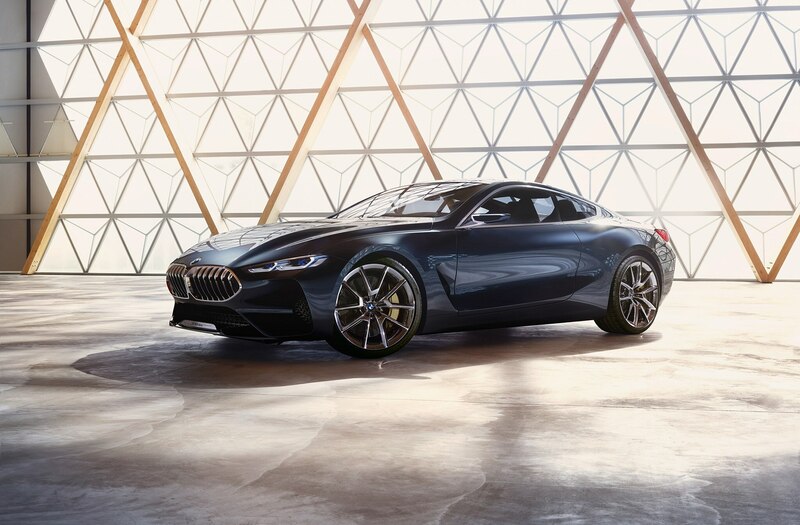 “The proportions on this car can’t miss,” says Marc Girard, a 24-year BMW veteran who is now the head of design for concept cars for the brand. 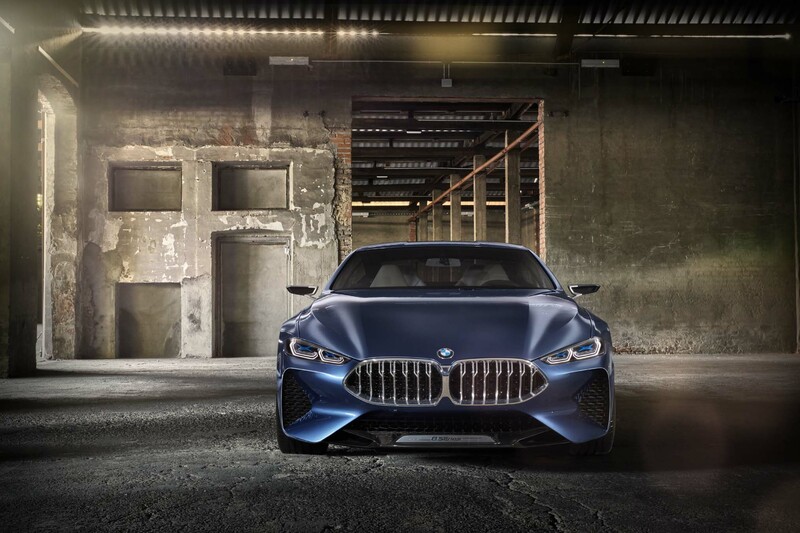 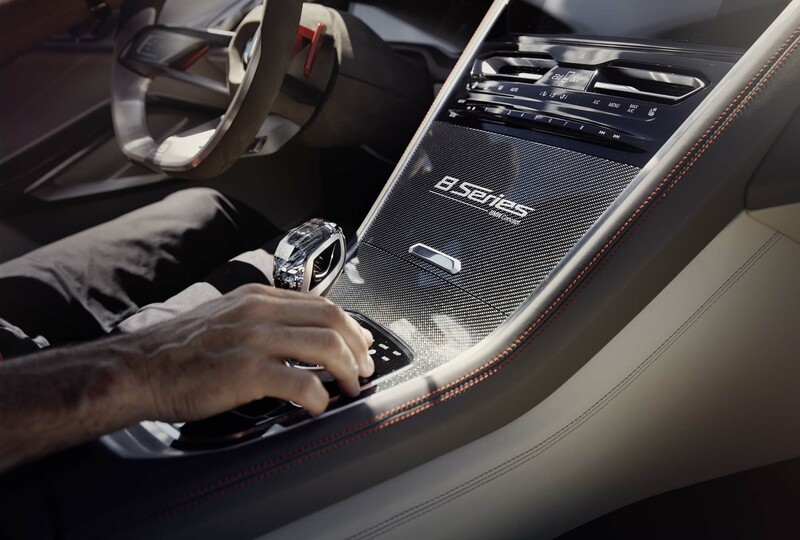 Up front, the Concept 8 Series boasts an updated take on its classic kidney-style grille (now appearing as a large singular piece bound at the center), flanked by similarly large air intakes on both sides and underneath and a jutting carbon-fiber splitter. 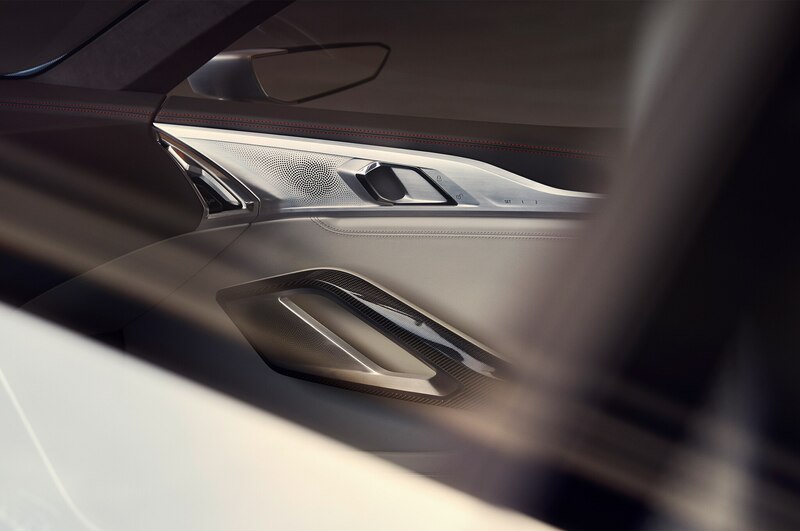 The central bulge of the car’s hood looks downright intimidating when you’re standing right in front of it and provides some detail to a rather long piece of sheetmetal. 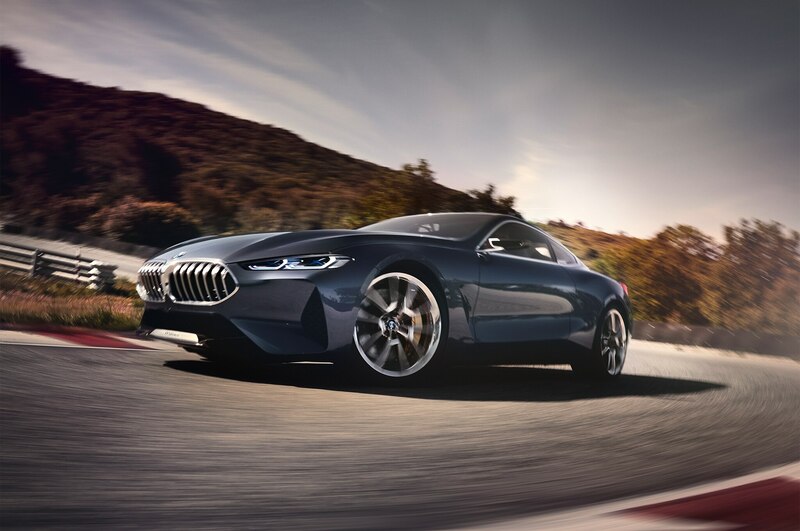 Along the sides, you can see the pillarless window frame, a signature of past BMW coupes, along with a massive vent behind the front wheels. At the rear, the rear window and bodywork sweep upwards into a curving trunk lid that juts outwards from the rest of the bodywork, similar to the “ducktail” spoilers of previous Euro-spec M3 CSL coupes. 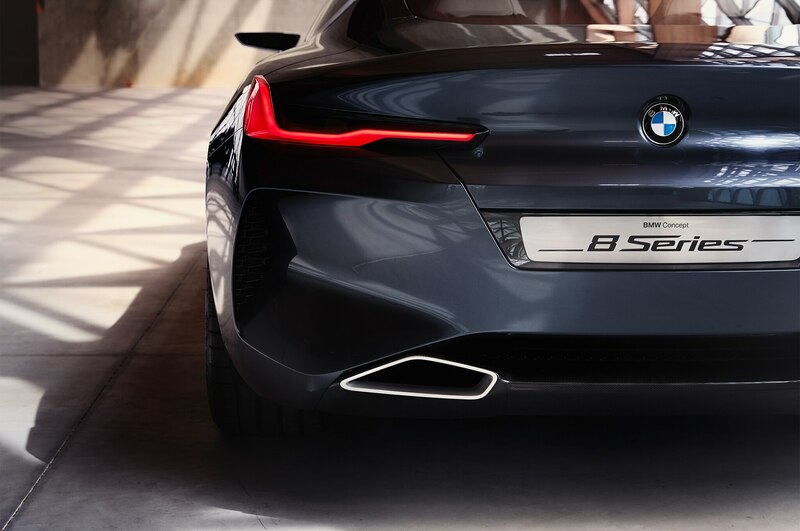 Taillights inspired by the i8 stand proud of the bodywork above the rear vents that are at least as large as the front intakes. 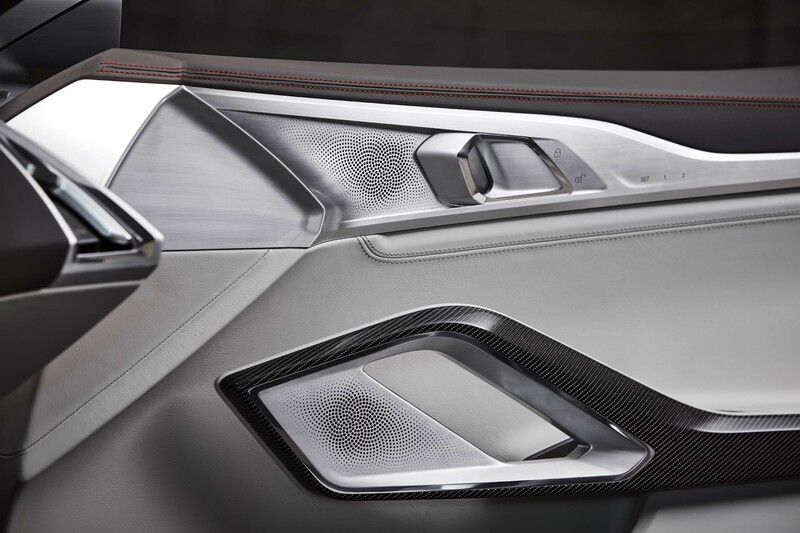 Twin trapezoidal exhaust tips frame the black rear diffuser. 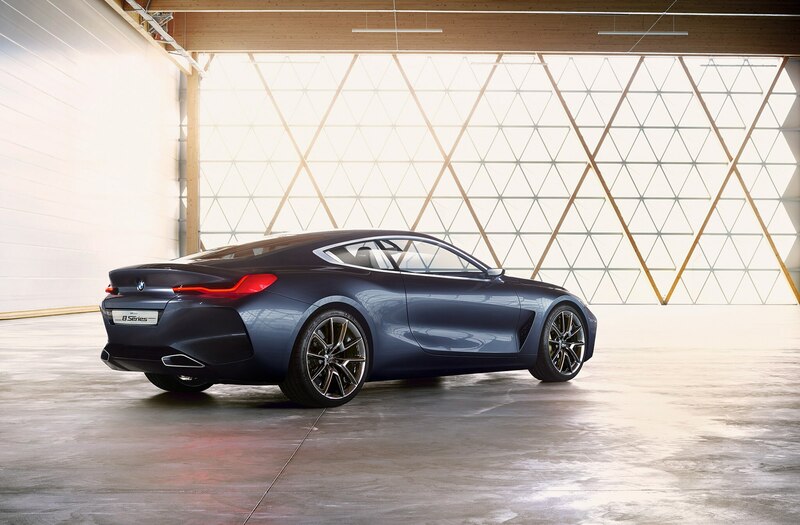 Twenty-one-inch wheels sit at all four corners and BMW calls the Concept 8 Series’ striking gray-blue hue Barcelona Gray Liquid. 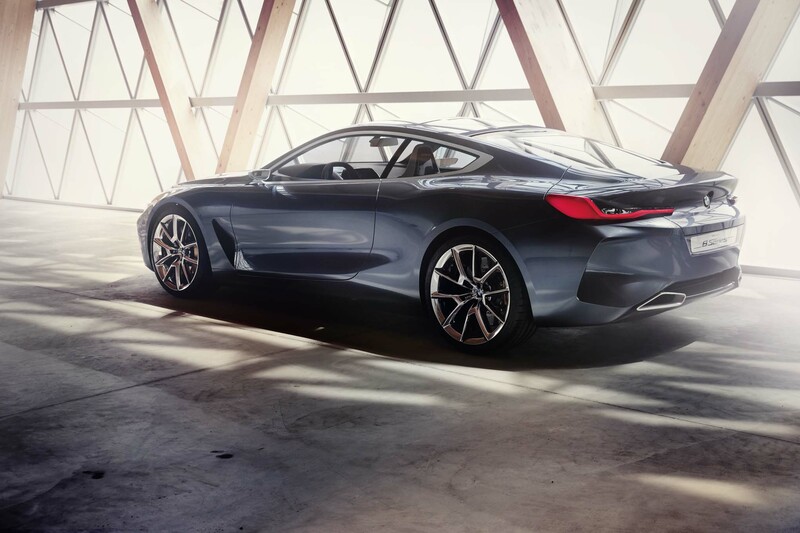 It’s a gorgeous liquid-metal color that we hope to see on more BMW offerings in the future, but it’s not cheap or easy to apply — figure about $12,000 per car. 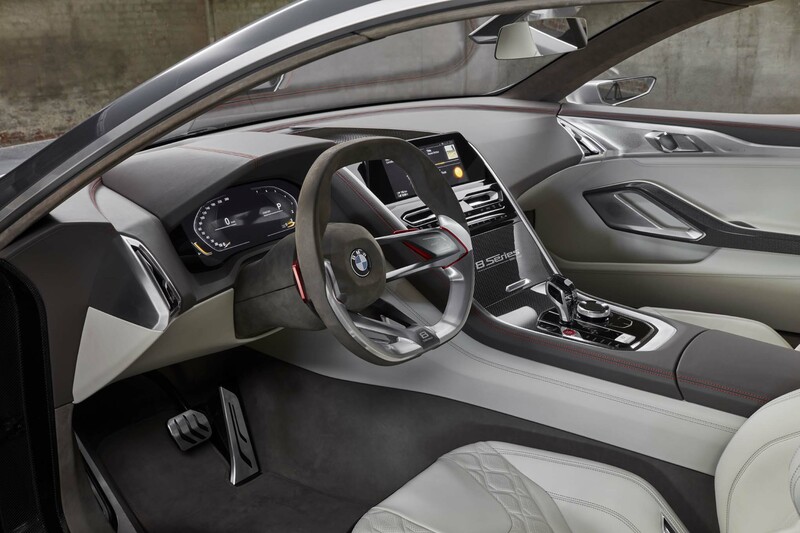 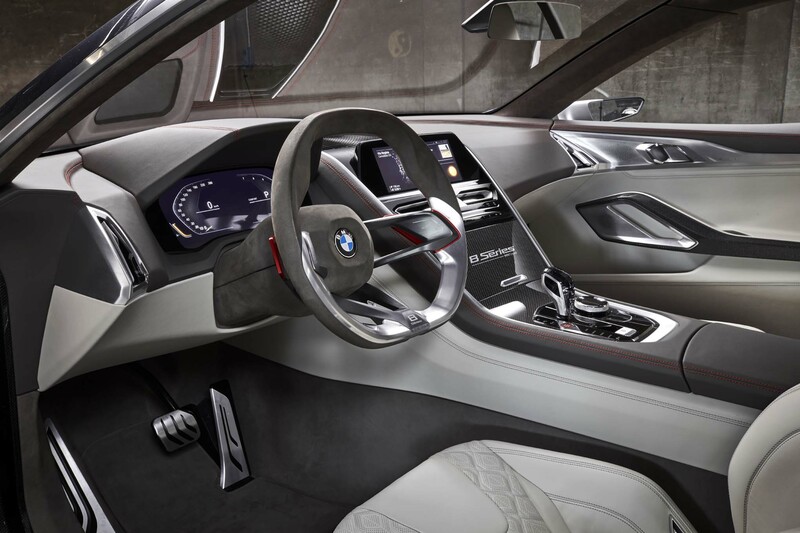 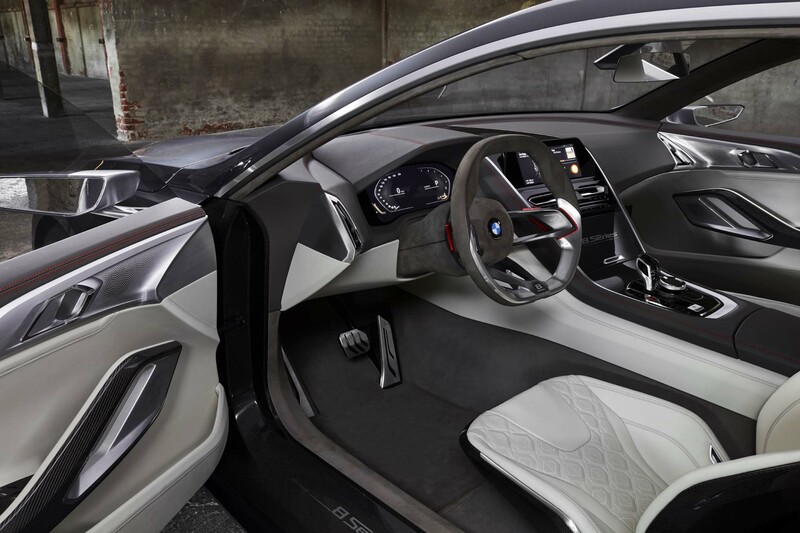 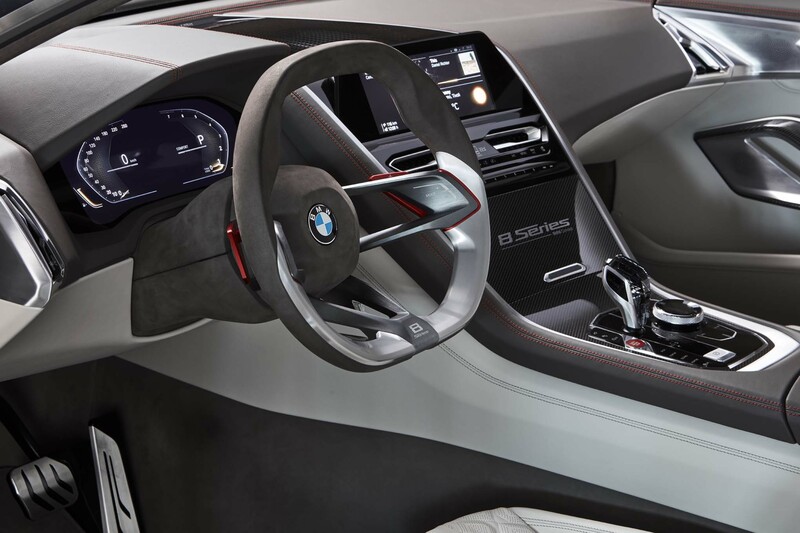 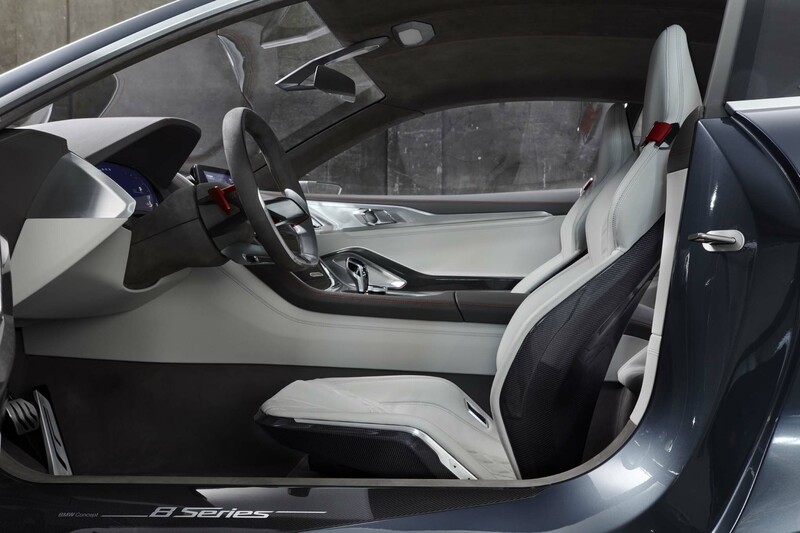 Inside, the Concept 8 Series looks every bit the show car it currently is. 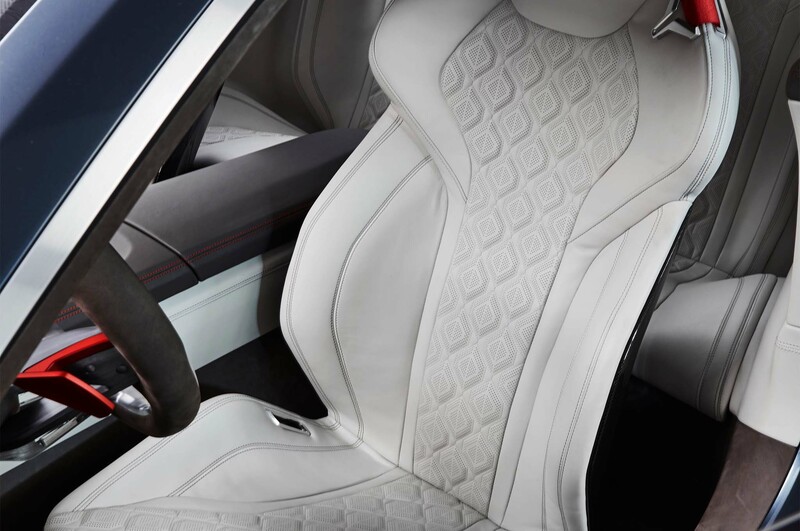 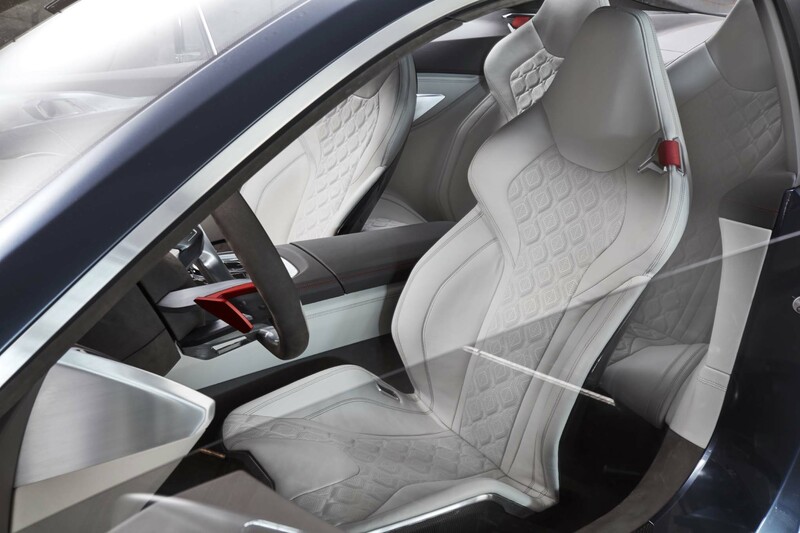 Light toned Merino leather contrasts with bright aluminum and dark carbon-fiber trim, while the seats are thin-framed and carbon-backed. 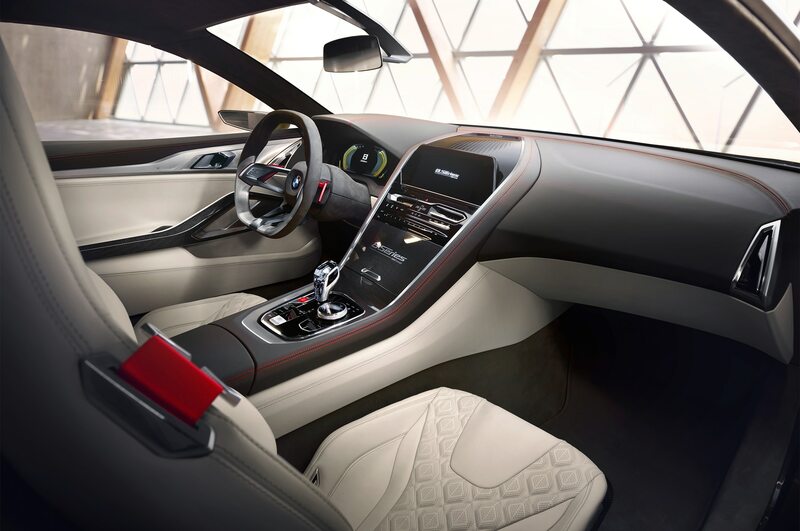 The iDrive knob is made from Swarovski glass and the shift paddles behind the deep-dish, aluminum-framed steering wheel are anodized in red. 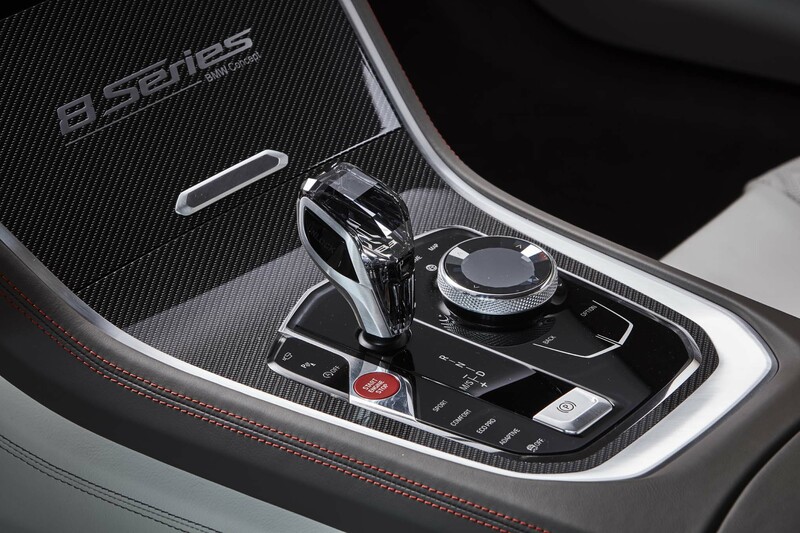 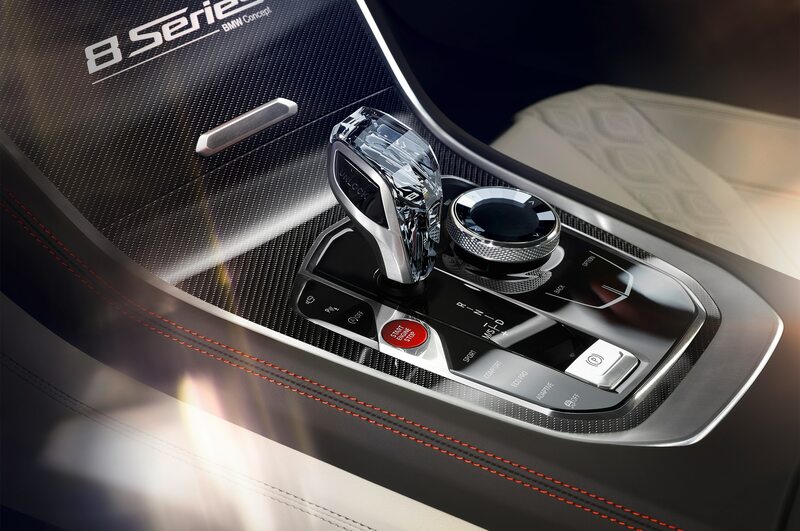 The center console and instrument panel seem to flow together, the latter being canted slightly towards the driver and covered in carbon fiber interwoven with strands of aluminum — another expensive process, but lovely to look at. 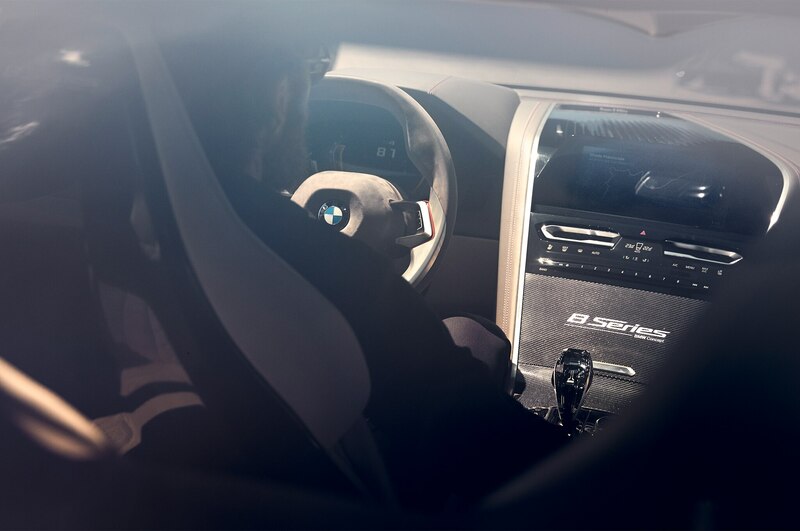 Any doubt that the car actually runs and drives is wiped away as a handler thumbs the start button to move the car around the studio. 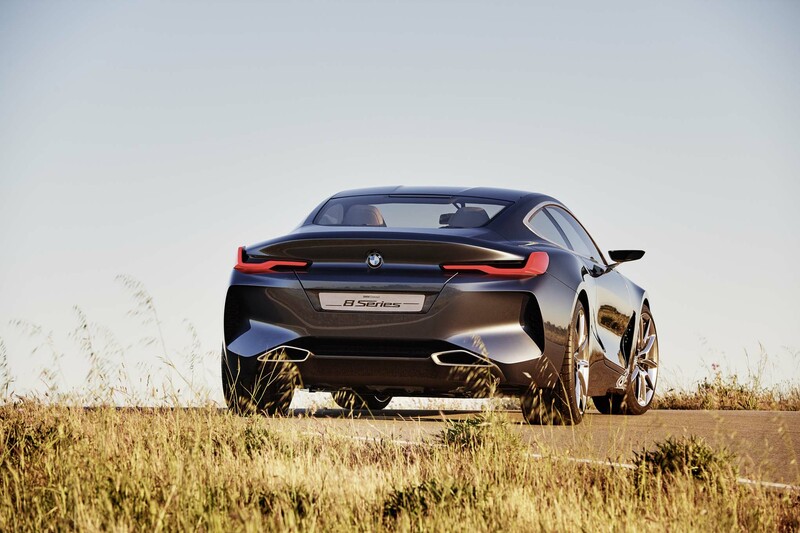 The coupe bellows out a throaty V-8-sounding growl on start-up and generally seems to be a little less muffled than what we’d expect from the production version. 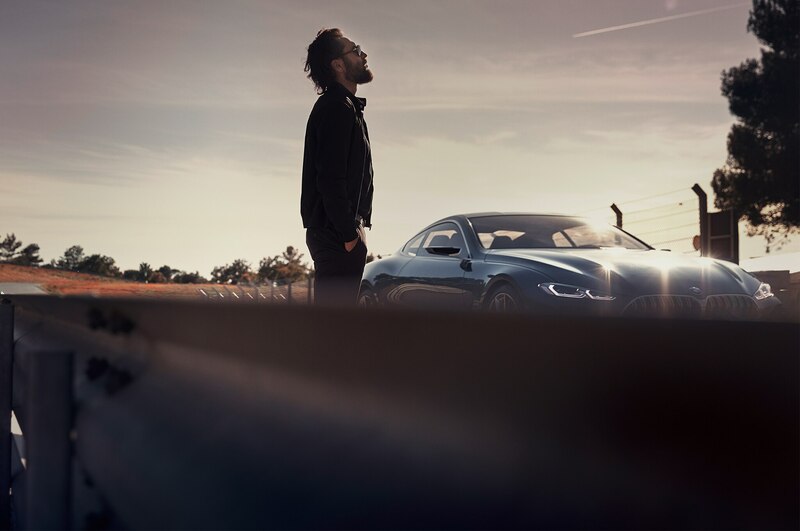 Yes, production version. 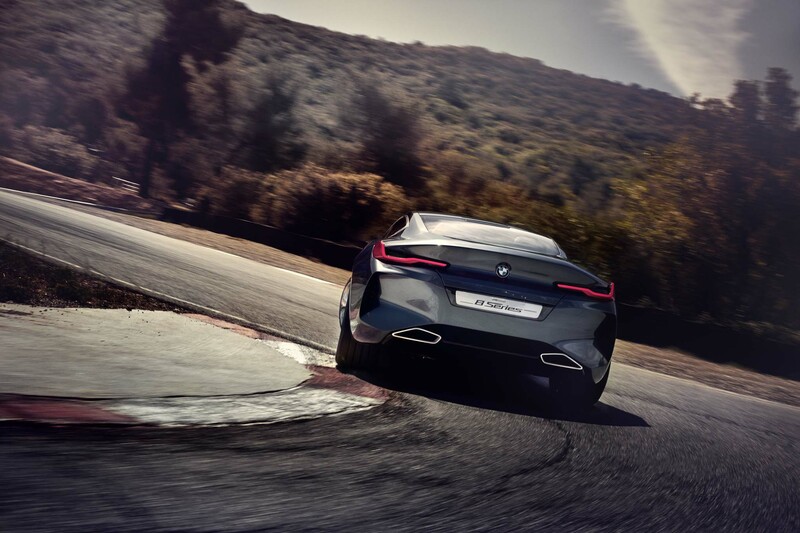 More than a mere styling tease, BMW expects that when it brings a production-ready 8 Series coupe to market in 2018 it will play a key role in strengthening the brand’s grip on the high-end luxury car segment. 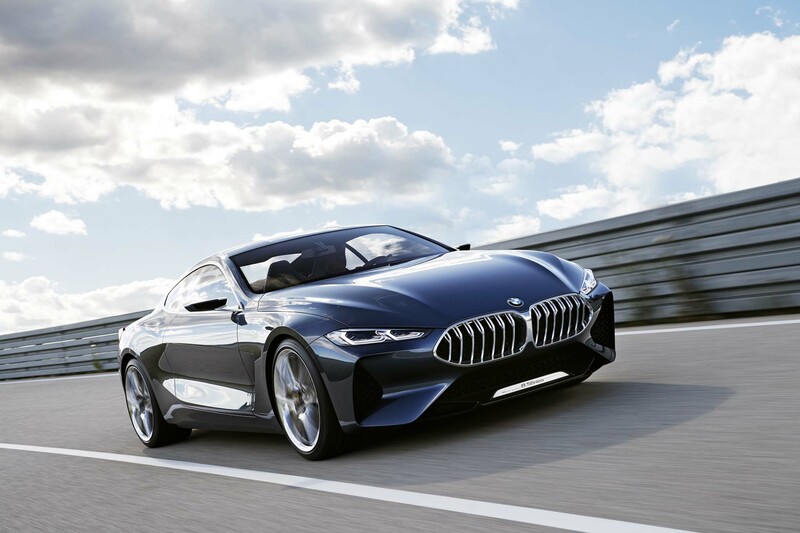 BMW is currently mum on what powertrains might be offered, but expect twin-turbocharged six- and eight-cylinder engines along with a possible V-12 at the top end of the range. 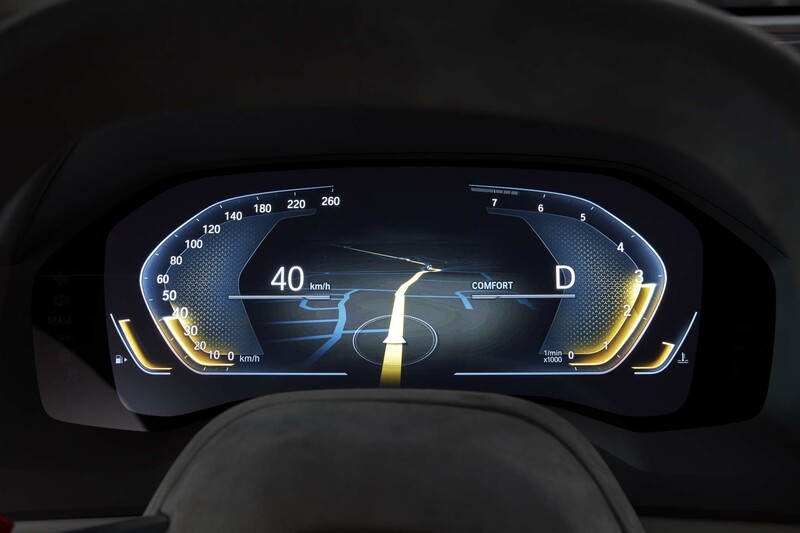 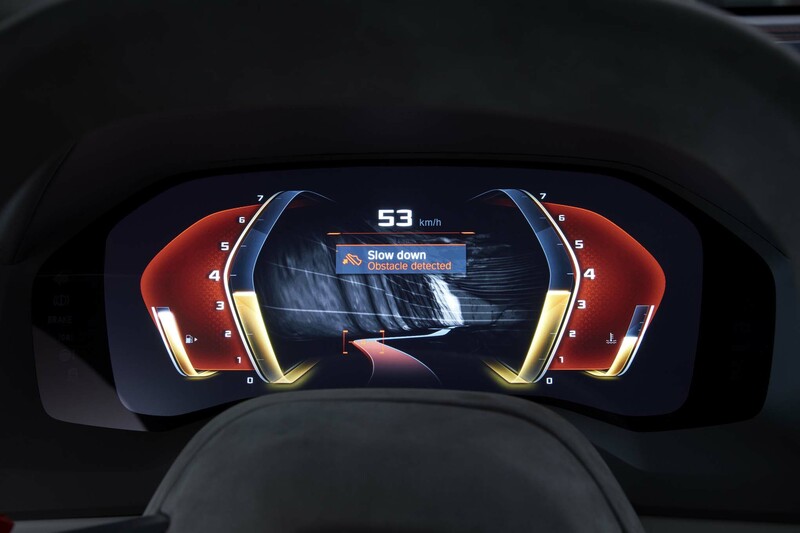 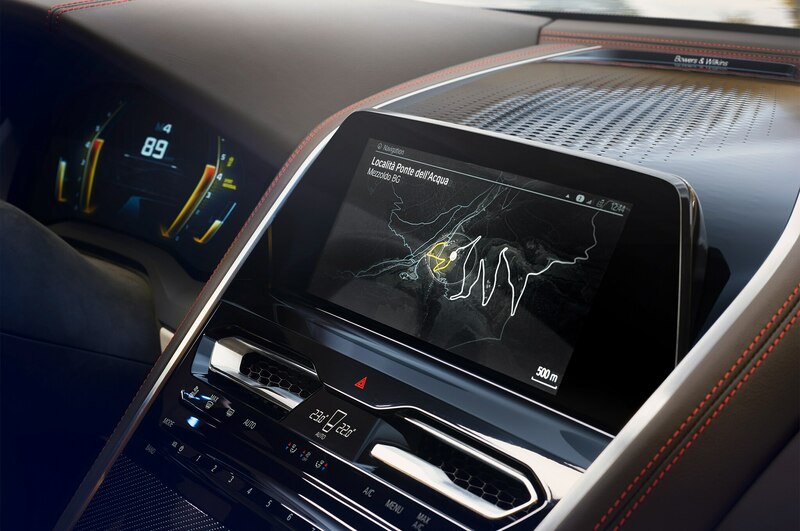 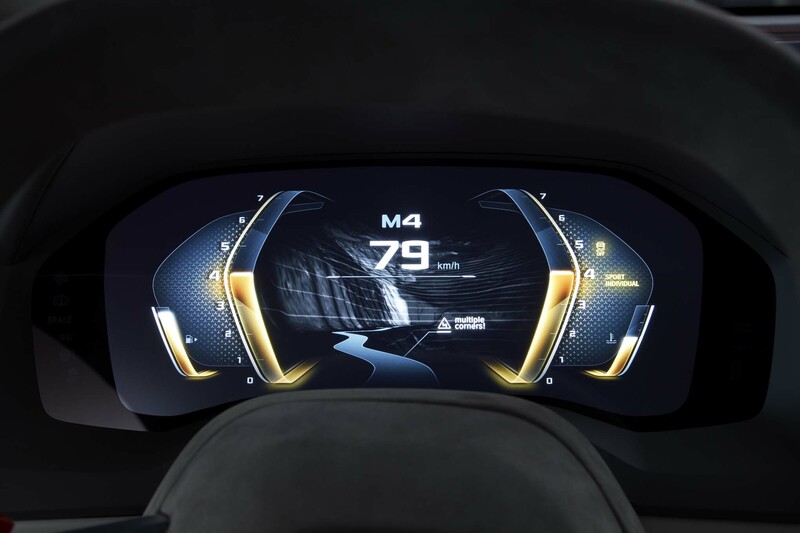 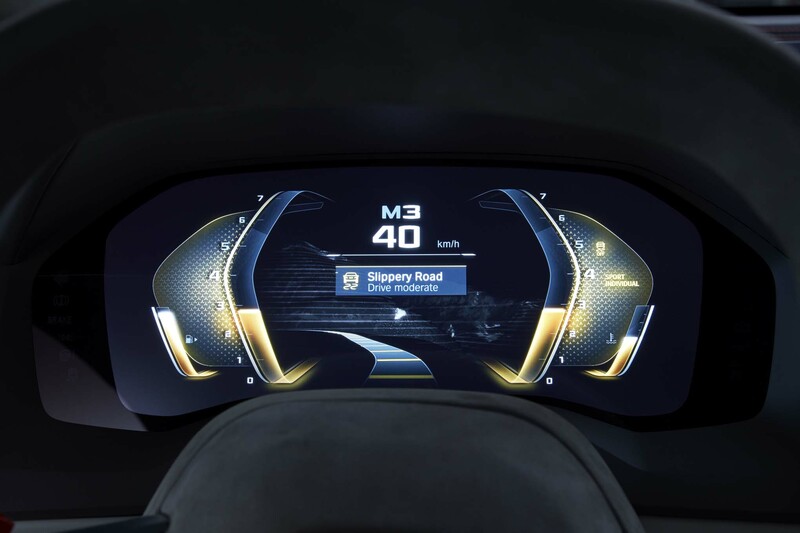 Don’t hold your breath for a manual transmission, but do expect BMW’s next-gen infotainment system to make its debut here. 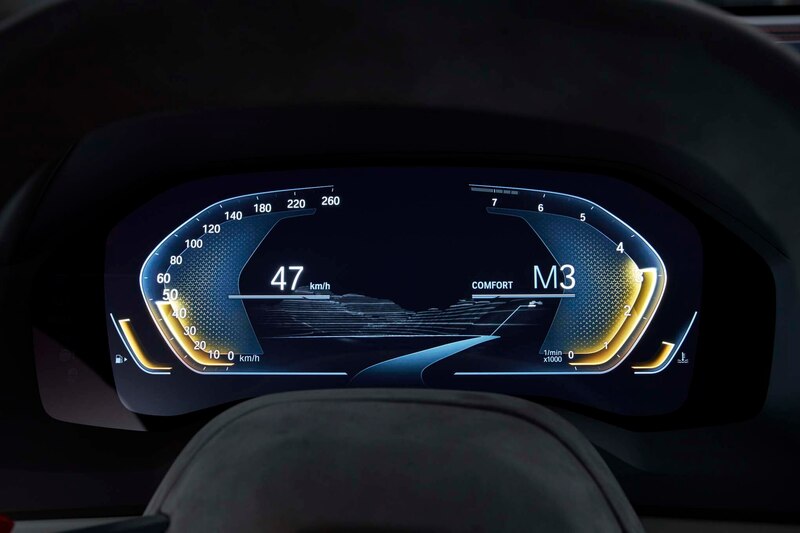 How much of this concept will we see in the production version? 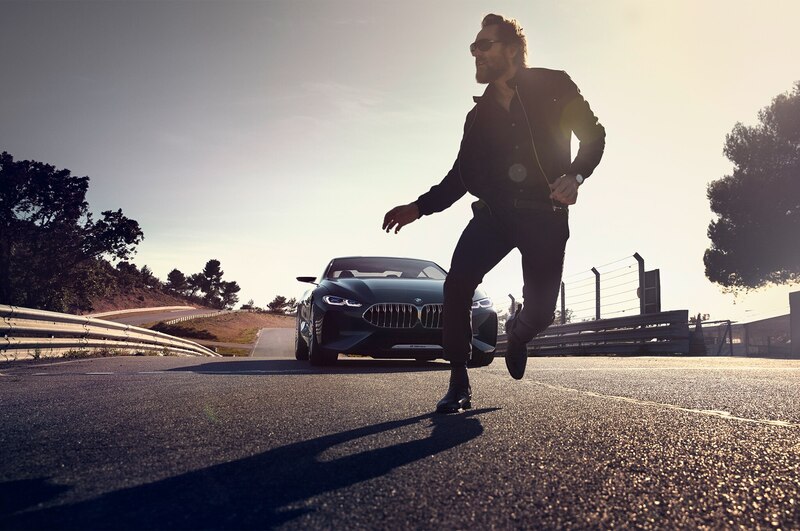 Girard holds his cards somewhat close to the vest. 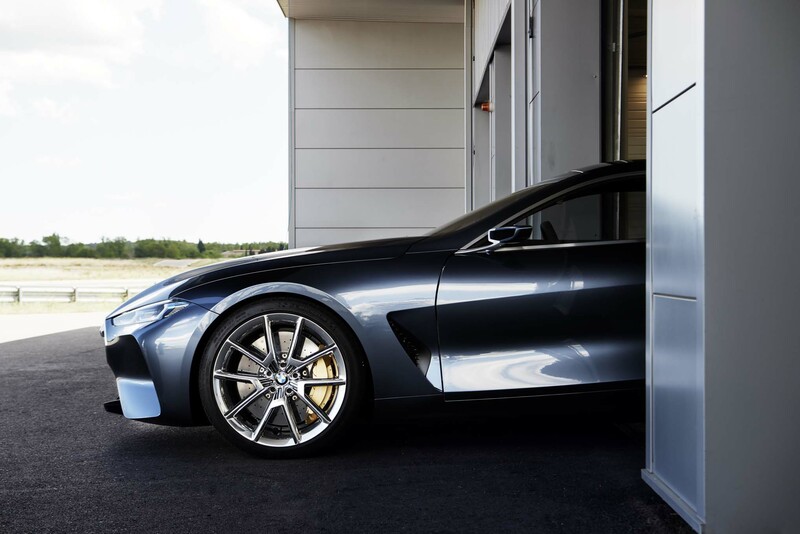 “This car is the essence of the production car,” he says with a wink.